G Shocks are more than regular wrist watches. They are part of your life and represent your personality. Once you start wearing them probably you wouldn’t wear any other wrist watch. After spending two years with out wearing a wrist watch I got this one. Its not that I did not have one. I have quite a few of them which I don’t wear (Six of them exactly!). I got a G shock for myself because it suits my personality. Here is my new G314RL belongs to rider series of G Shock. Yet another very cool gadget is added to my collection. I am happy, satisfied and wearing it everyday. 1. Read the post to see what G shock is made up of . 2. G shock was worn by Tom Cruise in MI 1,2,3 , by Keanu Reeves in speed etc. Next story Every Project Needs a Hero! Utility is there if you are adventurous, i.e dive, put your hand in the cooker or vehicle :) is it ? 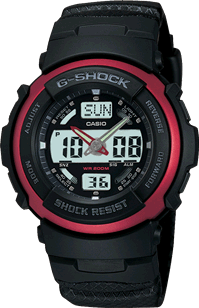 For 25 years Casio G-Shock digital watches are the ultimate tough watch. Providing durable, waterproof mens digital watches for every activity.